Aloha and welcome to one of the most popular beaches in the middle of Hawaii. Do you hear the splashing noise of the sea and the Hawaiian music playing in the background? 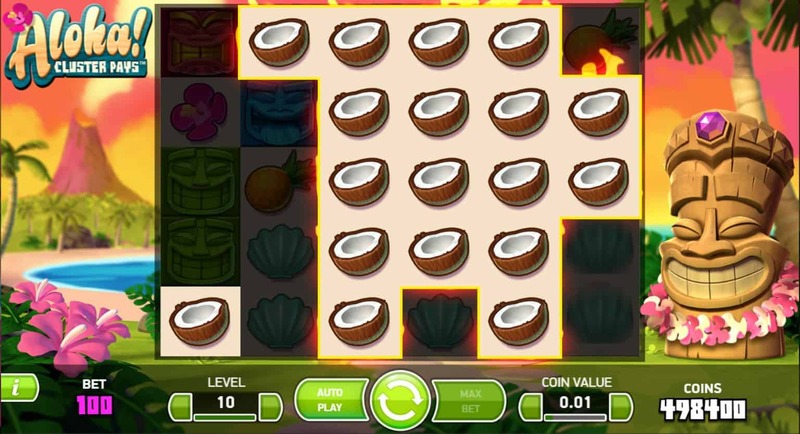 You will once you play Aloha! Cluster Pays by NetEnt. Aloha! Cluster Pays is a six reels, medium to low volatility slot game powered by NetEnt. The game does not have any fixed pay lines, the wins are made by landing clusters of nine or more of the same symbols. As the name suggests, Aloha has a tropical theme with the background showing a Caribbean beach. 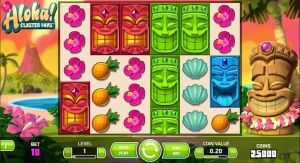 A totem pole stands on the right-hand corner of the screen and reacts to every win the player makes. The symbols on the reels are related to the Hawaiian theme and feature three Tiki masks of different colours (red, green and blue), a pineapple, a coconut, a shell and a flower. The higher value symbols are the tiki masks; in your reels, they may appear stacked and count as two symbols. The highest paying symbol of all is the red coloured tiki mask. The lowest paying symbol is the pink flower. The scatter symbol is a postage stamp showing a sunset with the words free spins on it. The wild symbol is a wooden box with a question mark on it. The wild can substitute for all other symbols except for the scatter. 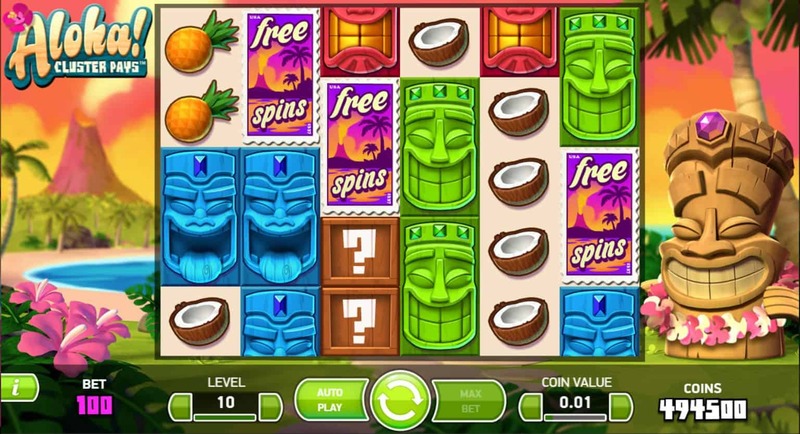 Free Spins are very common in slot games, but there are few that give it a unique touch like the one in Aloha! Cluster Pays. Apart from re-spins in the base game, the free spins round here will remove lower paying symbols and will give you a chance to win on your last spin. The Sticky Win Re-spins feature is randomly activated after a win during the base game. When activated, the symbols that formed the winning combination will be locked in place and a re-spin will be awarded. Nine symbols need to be adjacent to each other horizontally and vertically to make a cluster pay. If a similar symbol is landed during the free spin, connecting to the stuck symbols, that symbol will also get locked in place and an additional spin will be awarded. This will continue until no more combinations are available to the cluster. The game's main feature is the free spins feature which is triggered by landing three or more scatters anywhere in view (if you see half the scatter, it counts as a scatter). The number of free spins depends on the number of scatters landed. 3 scatters = 9 free spins. 4 scatter = 10 free spins. 5 scatters = 11 free spins. 6 scatters = 12 free spins. During the spins, the lower value symbols (fruit and flowers) will fall away from the reels gradually so by the end only high-value icons remain in play. Landing more scatters on your reel will award you a number of additional spins. 3 scatters = 1 free spin. 4 scatters = 2 free spins. 5 scatters = 3 free spins. 6 scatters = 4 respins. If the last free spin doesn’t result in a win, you will get re-spins until a win is made. For a medium to low variance game, we were expecting a bit more frequent wins than the ones that we got during the base game of Aloha! Cluster Pays. However, in the free spins round, we got decent pays. 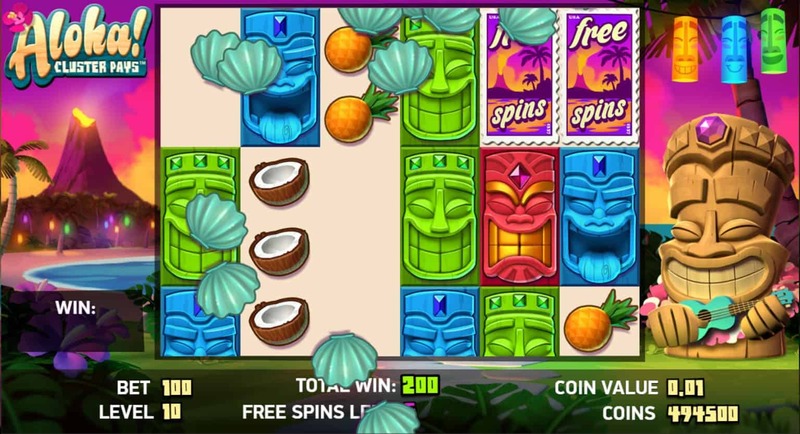 The sticky win re-spins (try to say that ten times in a row) are randomly triggered often enough to keep you entertained, but that is just about all that goes on during Aloha! Cluster Pays.